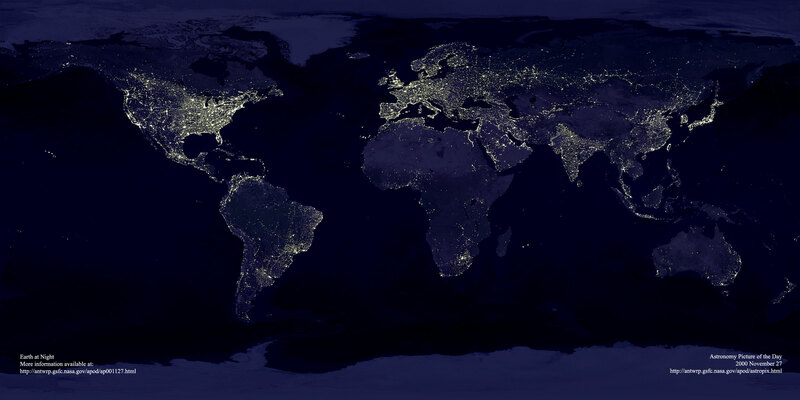 Here’s a beautiful shot of the Earth at night from NASA’s Astronomy Picture of the Day site. It’s big; if you look closely you can tell a lot of stories with it. For instance, South Korea looks like an island. There’s a line of blackness that starts right at the border with North Korea. Remember when you thought throwaway cameras were a crazy idea… now there are paper cell phones. Will everything be disposable in the future? Kids have been using paper dolls as friends for years. Can the full size adult version be far away? At least one phrase from Cockney rhyming slang has entered popular usage in the United States: raspberry. Why would the word “raspberry” describe a rude farting sound? Because raspberry tart rhymes with, well, you know. Learn all about it at the Cockney Rhyming Slang page. Fun free stuff from ArsDigita. As I understand it, Philip Greenspun is no longer the man behind Ars Digita, but the complete Philip and Alex’s Guide to Web Publishing is still available on the Ars Digita site. I finally got my wireless home network up and running. It’s much cooler than I thought it was going to be. Dan Bricklin’s description of his wireless setup was my key inspiration, so I’m including another link to it. He’s got a lot of good stuff on his site, including some musings about open source called The Cornucopia of the Commons: How to get volunteer labor. Interview with Norton Juster (of Phantom Tollbooth fame) on Salon: The road to Dictionopolis. I have fond memories of being read The Phantom Tollbooth in fifth grade.